This is about the time of year that I always start hearing people going on about how cold it is for spring. “Why hasn’t it warmed up yet?” everyone wants to know. So for now, let’s just deal with the lingering cold weather. Or even enjoy it. Soup always helps with that! I cooked my mushrooms in a separate skillet while I started my veggies in a pot, in the interest of saving time. 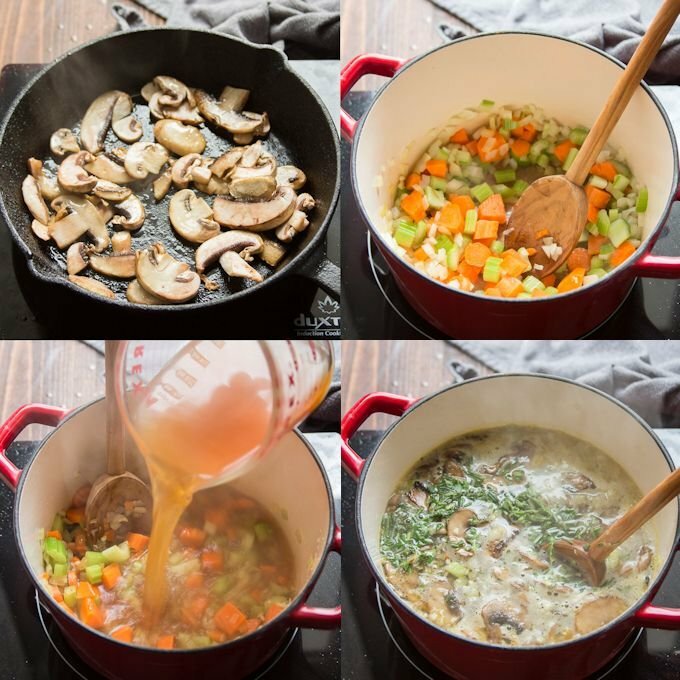 If you’re more interested in saving dishes, cook your mushrooms in the pot and then remove them while you cook your veggies. Sweat your carrots, celery and onions for a few minutes, then add some garlic. Give the garlic a minute to cook, then stir in some broth, lemon juice, lemon zest and herbs. Add the cooked mushrooms to the pot at this point. Let everything simmer until the veggies start to soften up. The orzo goes in last. 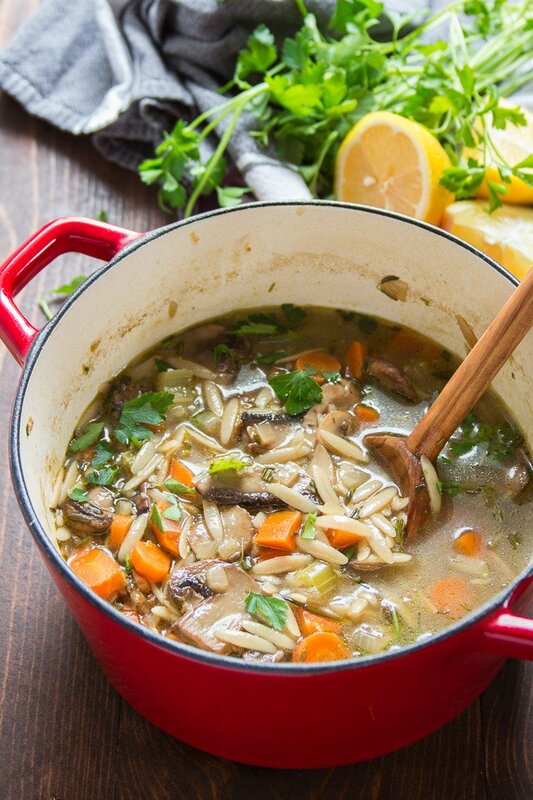 Cook the soup for a few minutes more, just until the orzo is tender. 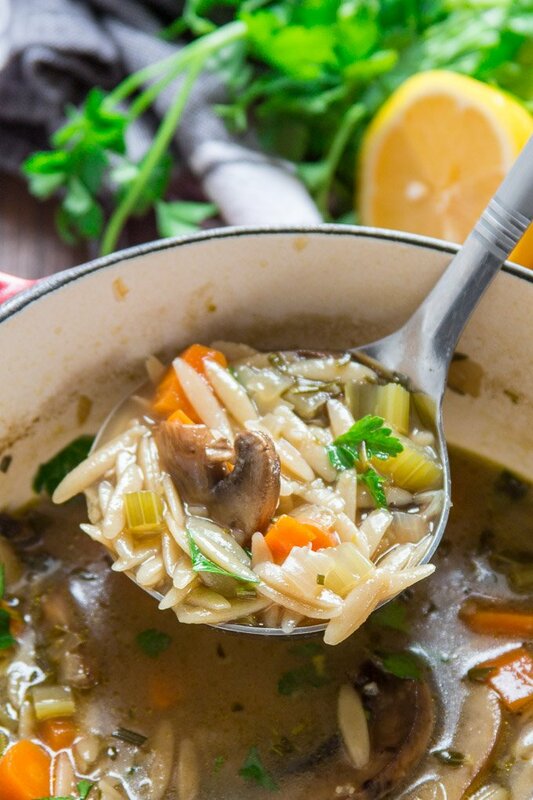 Leftovers will keep for about 3 days in the refrigerator, but the orzo will continue to soak up broth over time, and you might not end up with much left. You can add some extra broth during reheating if you like. Not into mushrooms? Understood! Feel free to substitute your favorite veggies, like broccoli, cauliflower or zucchini. If you’re going with a hard veggie like broccoli or cauliflower, add it to the pot along with the onions, carrots and celery. 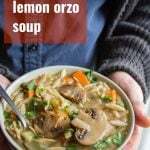 If using a softer veggie like zucchini, add it to the soup when you add the orzo. 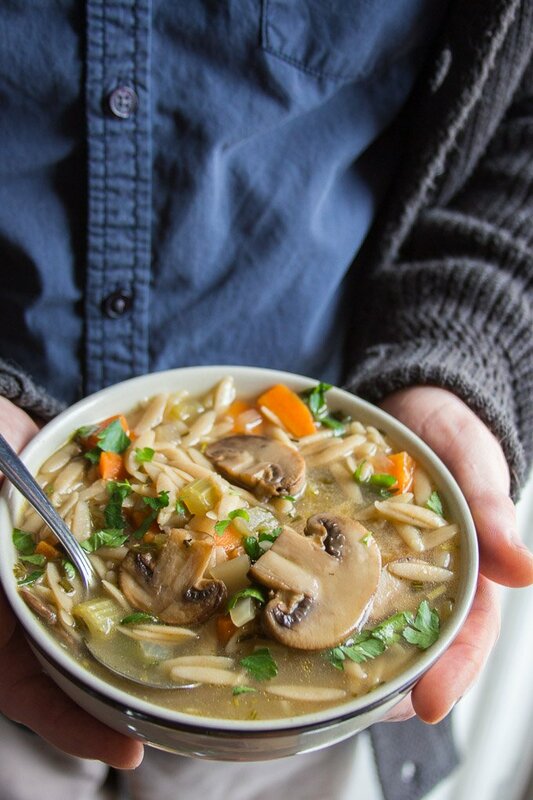 Want to make this soup gluten-free? Use gluten-free orzo, or any type of small gluten-free pasta. 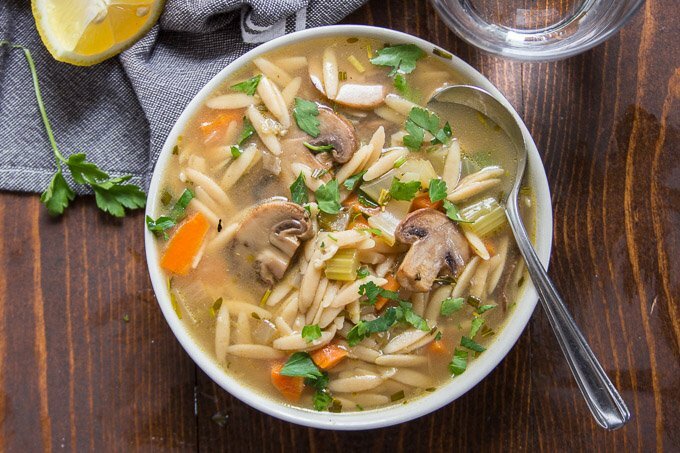 Want to add some protein and make the soup more meal-worthy? I added some diced up vegan sausage links to my last batch and it was great. Brown it in a skillet and stir it into the soup just before it’s finished cooking. Coat the bottom of a large nonstick pot with 2 tablespoons of oil and place it over medium heat. When the oil is hot, add the mushrooms in an even layer. Cook the mushrooms for about 5 minutes, gently flip, and cook for about 5 minutes more, until they're browned on both sides. Remove the mushrooms from the pot and transfer them to a plate. When the oil is hot, add the onion, carrots, and celery. Cook the veggies, stirring occasionally, for about 5 minutes, until they begin to soften up. Stir in 5 cups of broth, lemon juice, zest, rosemary and thyme. Return the mushrooms to the pot. Raise the heat to high and bring the liquid to a boil. Lower the heat to a simmer and allow the soup to cook for about 20 minutes, until the veggies are soft. Add more broth if the liquid reduces too much. Stir in the orzo and continue to simmer, stirring occasionally, until tender, about 8 minutes (refer to package instructions). Remove the pot from heat and season with salt and pepper to taste. Add more lemon juice if you like. My name is Bliss and I’ve been following your recipes!! I actually never cooked growing up, hating the aspect of standing over a stove. Even when I got married, my aversion to cooking meat was ridiculous.. 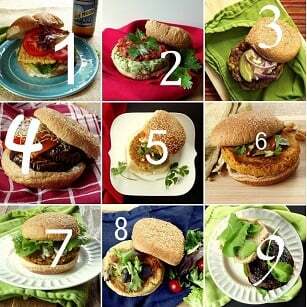 Since I’ve been vegetarian and vegan I LOVE TO COOK — even making recipes of my own. So I applaud you. This recipe you just posted has an excessive amount of salt in it. Where is the salt coming from? Thanks so much Bliss! I’m so happy to hear that! Most of the salt is coming from the broth. This is the nutritional calculator I use for my recipes: https://www.verywellfit.com/recipe-nutrition-analyzer-4157076 – the broth it selects by default is pretty high in sodium. You could try playing around with different brands or low sodium varieties to reduce salt content. Have you tried freezing it? It looks like the perfect soup to have on hand when your not feeling well. Can’t wait to try it! I haven’t frozen this one, but I think it would work just fine! Enjoy! My thoughts exactly! Thanks Sarah! just made your mushroom,orzo soup on drizzly seattle evening,put a little cilantro and garlic chives on top. was as delicious as any other of your recipes i,ve tried,great job as always. That sounds delicious! I’m so glad you enjoyed it! Thanks Tracy! Whoops! Thanks for the head’s up! And I’m so glad you enjoyed the soup! !